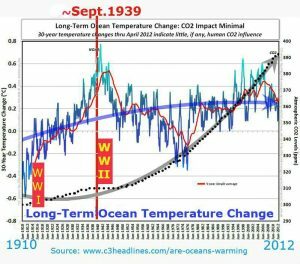 In a previous post we praised Dr. Judith Curry for her recent statement that “……the models fail to simulate the observed warming between 1910 and 1940.” (Fig.1) Here is our explanation: the models fail because this warming is man-made due to naval war during World War One (WWI – 1914 to 1918), Fig. 2 & 3. 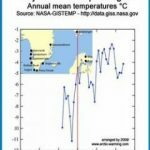 Therefor we amplify it briefly for Curry and other, which hopefully raise awareness on how easy man can interfere into nature and initiate a climate change. 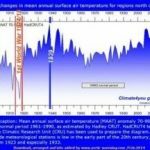 –1– Since the end of the Little Ice Age (LIA) around 1850, the Northern Hemisphere (NH) became modestly warmer until the mid-1910s. Then suddenly, temperature dropped significantly in the Northern North Atlantic (Fram Strait, Spitsbergen) since 1914 (Fig. 6, 7, 8), but exploded after 1917 until 1920, and continued to rise across the Northern Hemisphere, in North America up to 1933, until World War II commenced in September 1939. 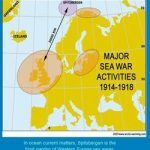 This dramatic climate shift has evidently – prima facie – a lot to do with four years war at sea that mainly took place around Great Britain (GB), and sea areas influenced by the Atlantic Gulf Current off GB. and a smaller part via the Barents Sea. –3— The northern branch of the Gulf Current, which has a thickness of up to few hundred meters transvers northwards as Norwegian- and West-Spitsbergen Current. The water is warm and has a high salinity. 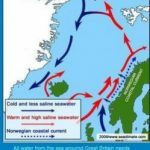 In contrast the Norwegian Sea Basin (mean depth 1740m) is colder and higher saline, as a varying sea surface level of several dozen meters, which is colder and due to rain and runoff significantly less saline. That forms a very complex environment, which was severely thrown out of its common structure. The atmosphere reacted instantly, Fig. 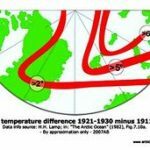 6, 7 & 8.
cc) The sea ice extend in the North Atlantic was the most sever in summer 1917, at least since about 1900 (more details HERE). 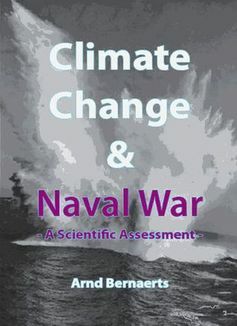 More details and a full picture is see book Chapter 8 “Caused Naval War the Arctic Warming?” HERE. 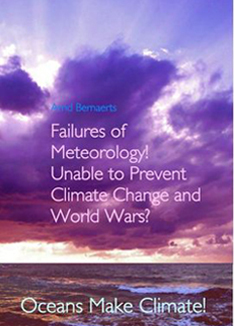 NEXT post by 18th Feb. is about man-made global cooling from autumn 1939 to about 1975. 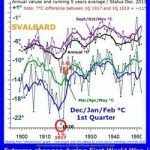 Next post: Winter 1947 brought a freeze – Which else?